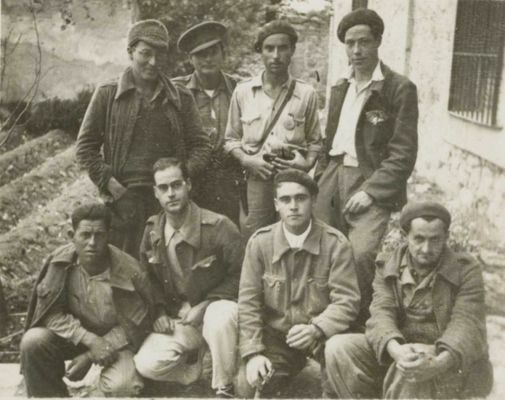 Photo credit: George Haber | George Haber’s uncle Louis Stoloff (lower right in the bottom row) left New York in 1937 to fight for the democratically elected government in the Spanish Civil War. The photo was taken in 1938, the year Stoloff was killed. When Stoloff left New York City, he was 27, the median age of the 2,800 Americans who went to fight. In 1936, when the war broke out, he was a shipping clerk earning $15 a week and living on Avenue B. Records show that in the war, his job was to help lay the wire that enabled field commanders to transmit messages, and he was among the more than 900 American soldiers killed. A great shame that one has to subscribe to the article to view it. But such is life. The photo was taken in the gardens of a particular building (which can be visited with permission through the right channels) in Ambite east of Madrid where the transmissiones were based as part of the XV Brigade Estado Mayor in the village. I would be curious to talk with George Haber and maybe the presenter, John Hane, to discuss his uncle’s time in Spain and also to send George a photo of the location today (it has hardly changed). I understand that Louis Stoloff died in the Sierra Caballs on the Ebro in September 1938? I am curious to know more about Louis Stoloff, but not through this link.